Abdominal Aortic Aneurysm – Total Vascular Surgery, Inc.
Abdominal aortic aneurysm is one of leading causes of sudden death in the US. According to recent medical survey, despite modern technology and advanced medical and surgical treatment, death rate from ruptured abdominal aortic aneurysm is still very high at 40-50% among those who made to the surgery and 90% mortality rate is true for those including not being able to make it on time. Therefore, early detection and surgical treatment is essential in preventing death. Most simple clinical diagnostic tool for abdominal aortic aneurysm detection is deep palpation at mid to left upper quadrant area. More than 90% of the time, a pulsatile mass should be appreciated in decent size aneurysms. This is a simple but very important clinical assessment skill for early detection of this deadly disease. Of course, abdominal ultrasound screening tool is as equally important as clinical skill. Again vascular screening for early detection of abdominal aortic aneurysm is currently under study and the commonly known ‘Lifeline’ screening is one of them. Etiologies for abdominal aortic aneurysm are multiple but atherosclerosis is the number one cause of this disease. Smoking, hypertension and hypercholesterolemia are the trio of enemy for atherosclerosis. Three most important concurrent medical conditions with AAA are coronary artery disease, Chronic Obstructive Pulmonary Disease and hypertension. Therefore, it is important to control hypertension and underlying lung conditions if anyone is diagnosed with AAA and in order to prevent worsening expansion. 15% of time it can be inherited as well. Cardiac evaluation is a must even if there is no history of cardiac disease in the family. Other indication for AAA repair includes heavy ulcerated plaque protruding out asymmetrically in the aneurysm. We call this “saccular aneurysm.” Usual aneurysm shape should be ‘fusiform’ which means uniform and symmetrical dilatation of aneurysm. Saccular aneurysm is non-symmetrical, meaning that one portion of aneurysm could be excessively protruding out and this can be very dangerous even if the size is not quiet 5cm in maximum diameter. 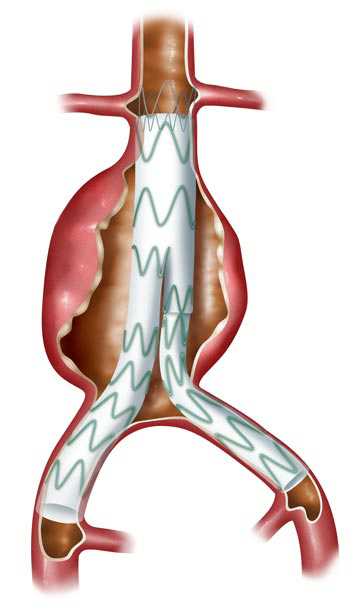 This portion of aneurysm can rupture easily due to that fact that is so inflated. Symptomatic aneurysm should be repaired regardless of size but it is very unusual to have symptoms such as abdominal or back pain in small size aneurysm. Some female AAA patients with small body habitus should be recommended for early aneurysm repair probably even at 4.5cm. There are other indications for AAA repairs but the most aneurysm patients should be referred to a qualified vascular specialist who can treat AAA and follow-up after such treatment. Iliac aneurysm is often found in AAA patients at the same time, in most cases. Iliac artery aneurysm can rupture as well if not treated at right time. 2.5 – 3cm in size is currently acceptable for timing of repair. Therefore, if a patient has 4cm AAA and 3cm iliac aneurysm in one side, this patient will require surgery. Common iliac artery aneurysm is the most common aneurysm followed by hypogastic or internal iliac artery aneurysm. If ultrasound study is not specific about iliac portion of study, one should note that there is a 50-70% chance of concurrent aneurysm at iliac arteries along with AAA. Surgical treatment for AAA is traditional open repair vs. endovascular repair. 80% of time or even higher with recent advancement of technology, endovascular repair is very possible. Short neck or angulated neck and even with 15% or more thrombosed neck could be accepted for endovascular repair with newly available devices. More and more non-invasive options are available today than 3-5 years ago. Of course, a close follow up is very important because of possible complications with endovascular stentgraft repair. Endoleak is the most common complication after endovascular repair, occurring in up to 10% of patients. This may require years of follow up and sometimes those individuals with persistent endoleak may require additional treatment. In summary, early detection can be easily performed by placing your hand in patient’s abdomen specifically looking for pulsatile mass. In normal individual, it should not be easily felt on deep palpation. Next, ultrasound study is very important tool to determine the size. Referral to an appropriately qualified vascular surgeon is very important for not only treatment but follow up as well. and we will get you in touch with Dr. Lim.